Some dogs don’t like bedding that rises up around them, so the ones with sides on them don’t work for these dogs. That’s why your pet might prefer the K&H Cuddle Cube Pet Bed. This bed is a comfortable pillow style bed. It has a cover made of Berber material that’s easy to remove for washing and comes in a choice of three colors. It also has a non-slip bottom. One thing that dogs like about this bed is that it’s very snuggle conforming and will adjust to his body. The K&H Manufacturing Cuddle Cube has a cute cube shape and is extremely thick to give your pet a cradling, comfortable surface to sleep. 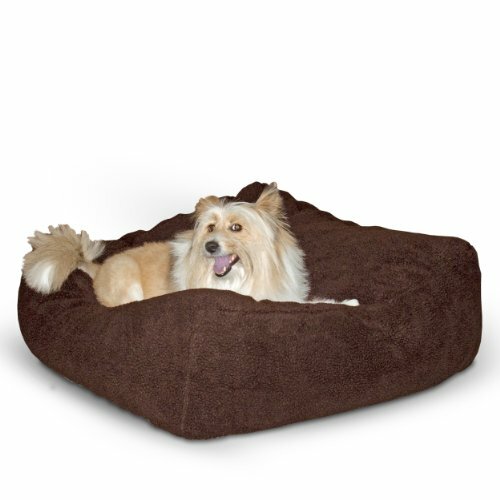 This soft cube surrounds your pet in luxury and the bottom features a non-slip surface so it always stays in place, something an older dog will appreciate.